EACC (Espai d´Art Contemporani de Castelló) is presenting the first solo show in Spain of the work of Monika Grzymala (Zabrze, 1970). 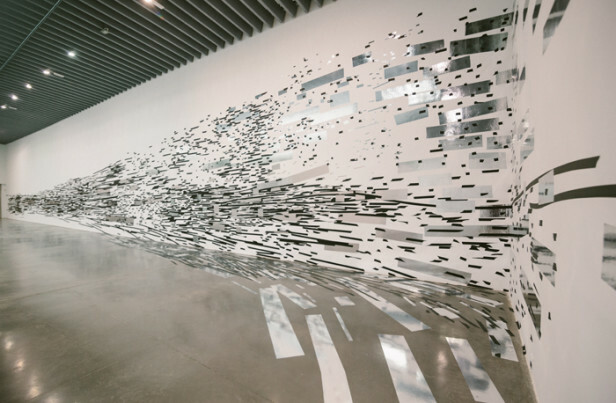 For this site-specific project the artist has used adhesive tape to create a temporary installation exploring the possibilities of three-dimensional drawing. Predicated on the use of the line, Grzymala generates a personal vocabulary that conceives drawing as “a form of thinking guided by the hand”, and at once inscribes it within the “conceptual” artistic tradition which foregrounded the primacy of the line. The show runs through January 8th, 2017. To find out more, click here. She is also exhibiting a new installation at Museum Marta Herford in Germany, where eight international artists respond with massice interventions, transformations and violations to the unconventional and self-confident architecture of the museum. To find out more, see this link. The show is on through February 5th, 2017. Photo courtesy of EACC and the artist.